The adverts published during the first half of 1940 begin to show the impact of the onset of war. The main effects on the manufacture and sale of domestic radios and radio chassis were the the growing scarcity of components and materials available for civil manufacturing due to it being required for war supplies. That scarcity, in turn, had the predictable effect of causing prices to rise. As with other companies, Armstrong did initially try to avoid price rises, but eventually had to give in and the retail prices of chassis were increased. The AW125PP chassis was reviewed in the January 1940 issue of Wireless World, and the review was a positive one, thus it was mentioned in some of the later adverts. This is exampled by the advert shown in Figure 1 from the following April’s Wireless World. The ad also makes mention of some of the effects of the war upon prices, etc. These and some later adverts continue to offer various chassis for sale, but it is unclear just how many were build and sold during this period given the limited supply of parts and materials. The advert which appeared in June’s WW (see Figure 2 above) also mentions paper rationing and the resulting decision to charge for catalogue. The Practical Wireless of 27th July’s advert offers a few examples of some older chassis designs – RF96 and RFPP7 – which had presumably been sitting at the factory for some time. The August issue announces that Armstrong were actually now unable to supply some of the chassis which they had previously accepted orders for. This indicates fairly strongly that the supply of necessary parts or materials had become much more limited than they had expected. The EXP48 advertised in the same issue was said to be based on the earlier AW48. It was presumably primarily being made for export because the ‘EXP’ indicates an export model whereas the ‘AW’ indicated ‘All Wave’. Thus it would presumably have been a ‘colonialised’ set built to work reliably in hot wet locations, etc. The implication is that by this time Armstrong were concentrating on the more rugged EXP chassis for use in places outside the UK. This may have been because the rationing system made it easier to get materials and components for export sales to help the UK economy. But it also raises the possibility that such sets were being used for war purposes of some kind. The advert in the October issue of WW specifically mentions “...our new friends in Argentina, Portugal, Russia, and Spain...” and mentions that a few EXP48 chassis were available for the home market. Again, the implication is that export production and use was the priority. During the first few months of 1941 Armstrong continued to advertise their EXP48 chassis for sale. However the signs were that only a few sets were actually available for domestic customers. The adverts don’t give an indication of how many sets were being sold abroad, or to whom. 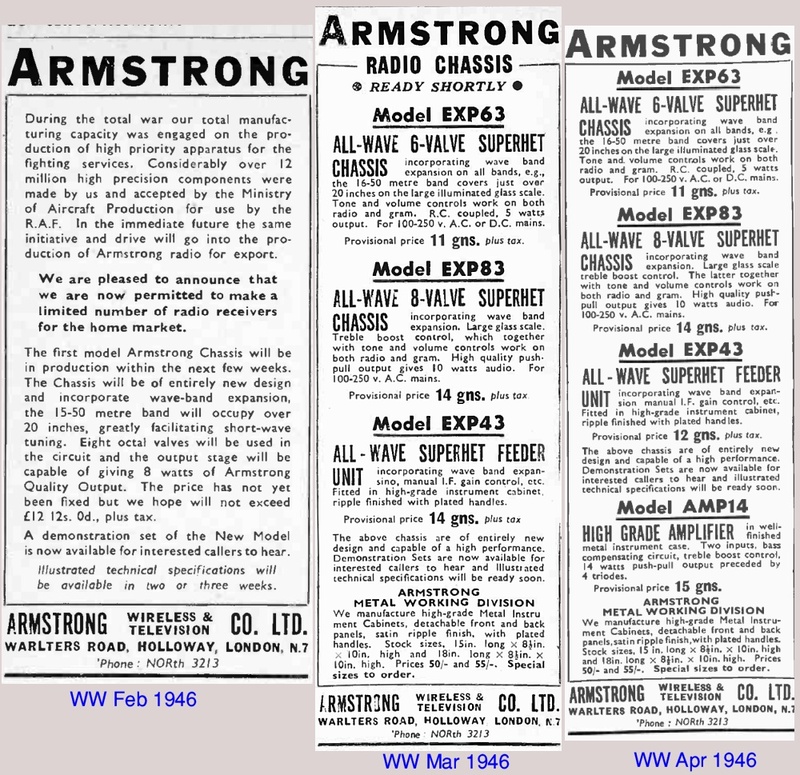 From March onwards the adverts made increasing references to Armstrong’s service department. In particular letting people know that they would now service radios made by other manufacturers. From April 1941 onwards the emphasis placed on servicing increased. Adverts also made clear that the company was willing to buy back old models – even ones not in working order – either to repair and resell, or cannibalise for the parts and materials. The adverts also begin to mention ‘coil packs’ and other sets of components being available. In modern terms, Armstrong’s ‘target sector’ of the market in the 1930s and 40s was radio enthusiasts willing to do some DIY, and who probably had some technical knowledge or practical experience. Buying a complete chassis was a quick way to get a working set with good performance. But again in modern terms, this also made the Armstrong chassis models attractive to buyers who wanted to ‘tweak’ and experiment with something that already worked fairly well. Chances are that some of the WW and PW readers who bought such sets would already have some spare valves and other bits of electronics in their home, even if they lacked the skill to do a complete design from scratch. Apart from the valves, the key parts of a radio were the frequency-dependent circuits which controlled the local oscillator, and various (RF and IF) filters in the radio. Usually, the radio was tuned by a mechanically adjustable set of capacitors connected to a control knob on the front of the set. This worked in conjunction with a set of coils designed to suit the capacitor and give the desired results. Much of the detailed work in making a set that performed well resided in the way these coils and capacitors operated together. It took a lot of skill and experience to get the precise arrangement of coils that would do the job well. 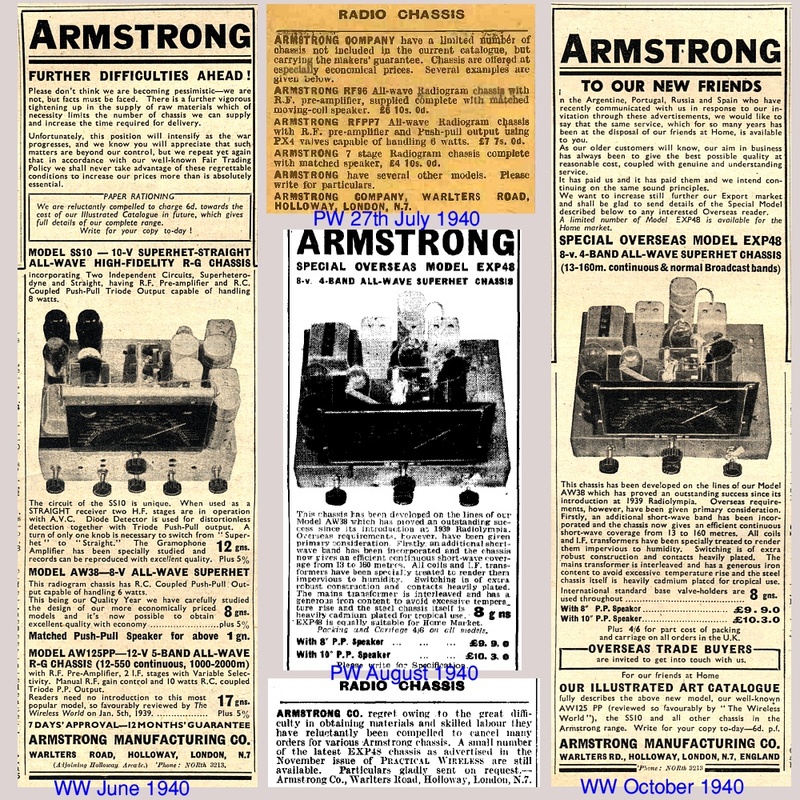 By providing coil packs Armstrong were able to make it much easier for someone who already had other items like an old chassis or some valves to build their own good-quality radio receiver. The sales of coil packs were a win-win outcome for both Armstrong (because they could sell something useful) and any customer (who could now make a working set) that already had the other items required. As a result, coil packs were often mentioned in adverts from this period of the war onwards. But again, it isn’t clear now just how many were sold, or how many working radios were produced by customers as a result! All of that said, however, the adverts for coil packs, etc, indicate that during this period some key components like valves were in very short supply for domestic purposes. The likelihood being that they valves were more urgently needed for the war or UK export income. Fig 5 - 1942 representative examples of what appeared in the adverts. The advertisements during 1942 which I have been able to find all paint much the same picture as those from the latter part of the previous year. The above selection comes from a series of similar or identical examples in other issues of WW during 1942. 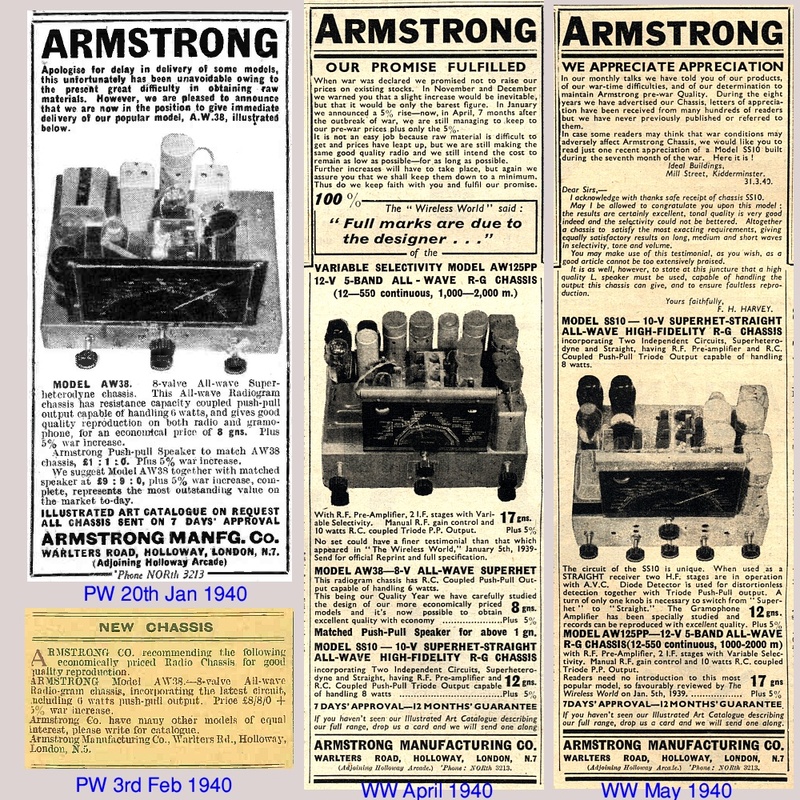 Armstrong’s public activity was still directed towards the sale of coil packs, other assorted components, and servicing older sets. When I worked for the company I was told they did some munitions work, but there is no sign of what it may have been, or when it occurred, from these advertisements, nor the ones published in 1943, 1944, and 1945. Fig 6 - 1943 and 1944 focus on service. During 1943 the adverts simply focussed on service and repairs. It seems that during this period even the supply of components for coil packs was difficult to obtain. The advertisements I have found thus far present a picture where Armstrong were apparently confined to repair work during 1943 and 1944. To the point that they changed the company name used in those adverts to explicitly mention “(Radio Service Dept.)”. In itself that “Dept.” might imply other types of activity not mentioned in the adverts, but there was no overt sign. Fig 7 - Examples from 1945. 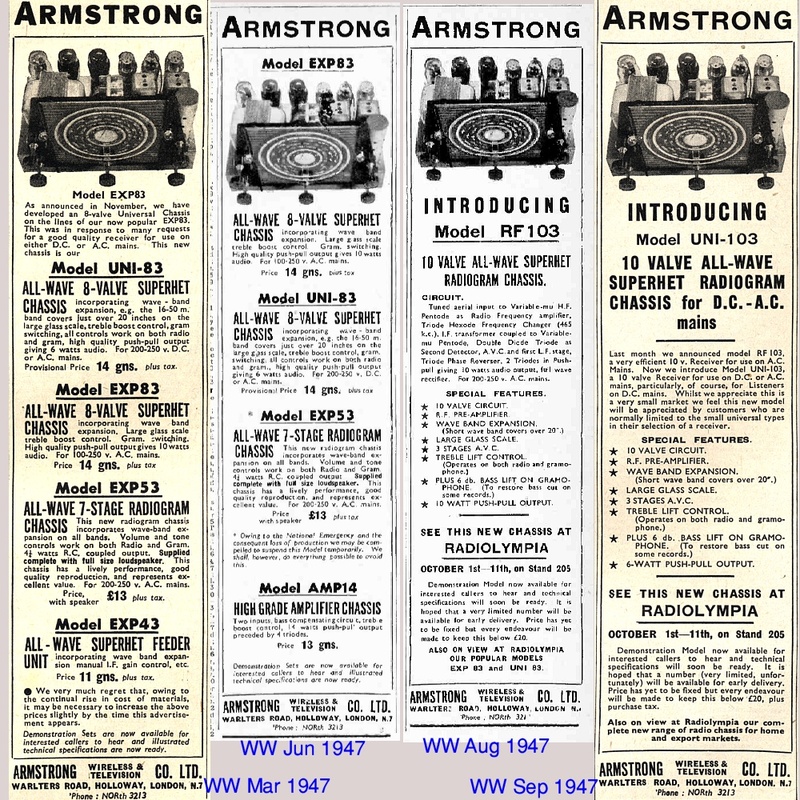 During 1945 most of the Armstrong adverts which appeared simply presented the same basic message as the example shown above from the February issue of Wireless World. Essentially these just thanked patient customers and assured them that the company would resume normal business after the war. Their are two particular changes during this period which are worth pointing out. The first is that in February 1945 the company name used in the adverts changed to “Armstrong Wireless and Television Co Ltd”. Thus the company was indicating that from now on it was – or intended to become – a manufacturer of television receivers as well as sound radio chassis. The second is the “Now the war is over” advert in December and its comment that, “Gradually restrictions are being removed”. The presumption being that the end of rationing and shortage of materials for domestic manufacturing would happen soon. Unfortunately, as with the previous years, the adverts don’t give any sign of possible work in other fields during the period. Fig 8 - February to April 1946. 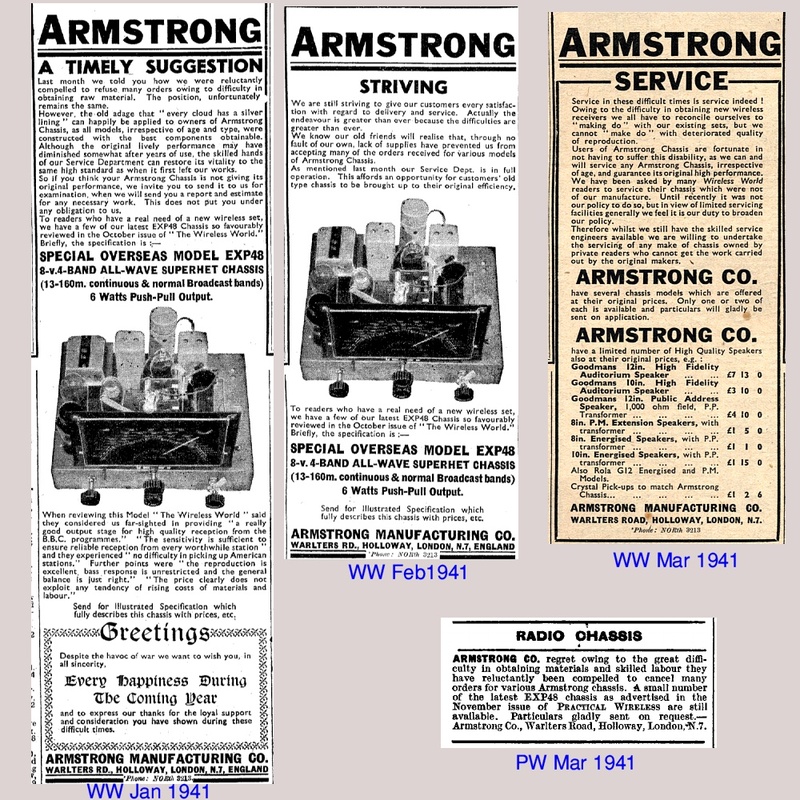 The February 1946 issues of Wireless World carried an Armstrong advertisement unlike any other that I have – so far! – been able to find. It confirms that the company was engaged in war work of some kind for the Government. But gives almost no details. I will quote the relevant wording because the scan I have obtained of that particular advert is of poor quality, so may be hard to read. 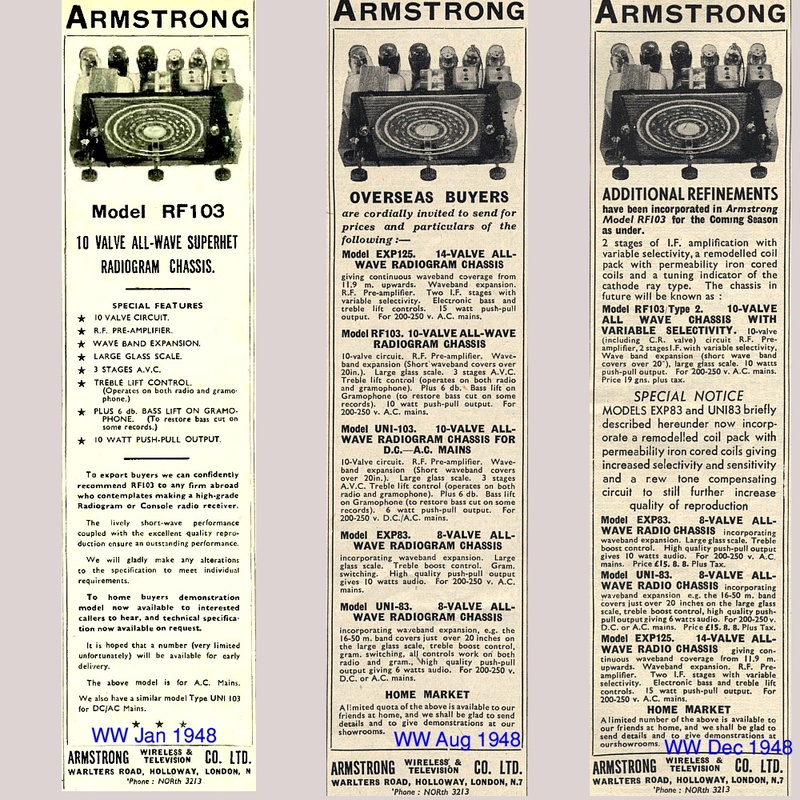 From March 1946 onwards the Armstrong adverts show that – at last – the company was able to switch back to the producing of domestic electronics. The March advert announces that the EXP63, EXP83, and EXP43 radio chassis would be “Ready Shortly”. The EXP prefix indicates these are ‘export’ designs – i.e. ones made to a design and standard suitable for export and possible use in extreme environments around the world. The advert also mentions an Armstrong “Metal Working Division” able to supply panels, etc. What isn’t clear is if this indicates that some similar sets and metalwork were also being made for use/sale outside the UK during the previous years, or if it simply picks up and carries on from peacetime before the war. The advert in the following (April) issue of Wireless World indicates that these radio chassis are now on sale. It also mentions the AMP14 14-watt amplifier for the first time. Fig 9 June to December 1946. During the second half of 1946 the range of chassis designs Armstrong began to produce increased. In June they said the EXP53 would be “Ready Shortly”, and this was duly advertised as being available in the July issue. In November they announced that the UNI-83 would be “Ready Shortly”, and it was then offered for sale in December. The ‘UNI’ indicated that the set could be powered by either a.c. or d.c. mains. (Many UK areas were fed d.c. mains at this time. It was only in later decades that these were replaced with a uniform a.c. mains system.) Hence by the end of the year Armstrong were offering six models – EXP43, EXP53, EXP63, EXP83, UNI-83, and the AMP14. Fig 10 - Up to September 1947. 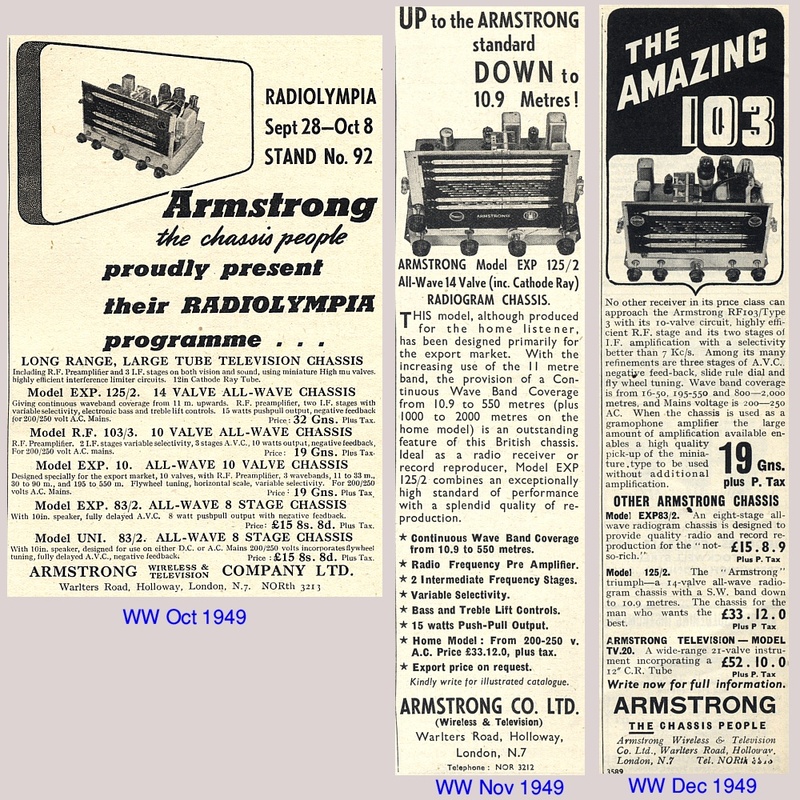 During the summer of 1947 Armstrong introduced two new chassis models – the RF103 in August, and the UNI-103 in September – saying they could be seen at the Radiolympia Show. As was Armstrong’s established practice the ‘UNI’ designation indicated a set that could be powered by either a.c. or d.c. mains. Fig 11 – Last quarter of 1947. 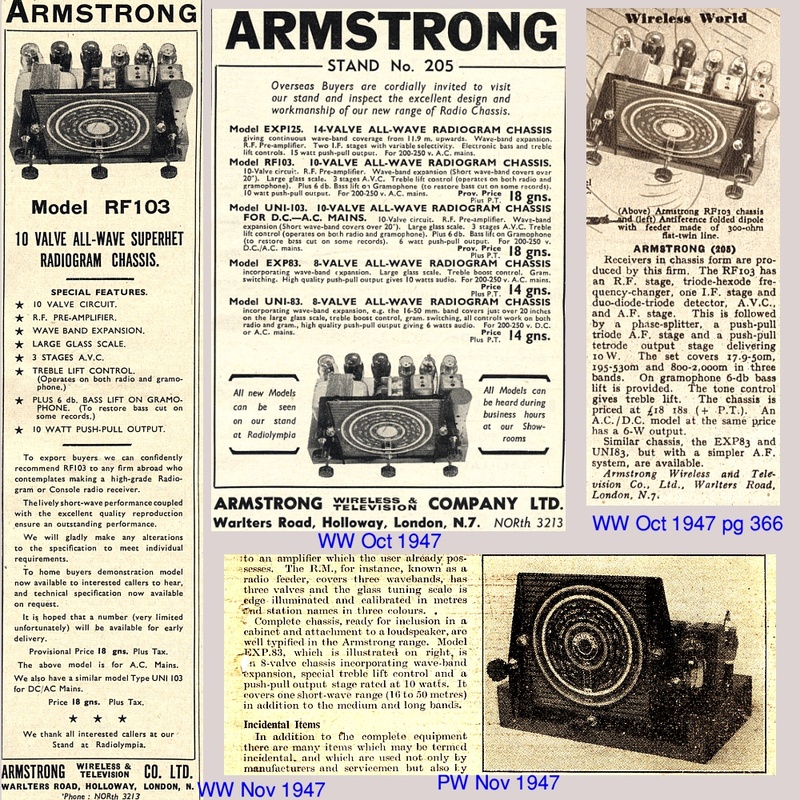 The October issue of Wireless World contained a new advert for the Armstrong chassis. In particular, this mentioned the EXP125 in addition to the RF103, etc. The Olympia Show feature in that issue of that issue of WW also provided a graphic and some details of the RF103. The November issue of WW had an extended advert for the RF103. The Show feature in the November issue of Practical Wireless reported on the EXP83 and provided a photo of the chassis. 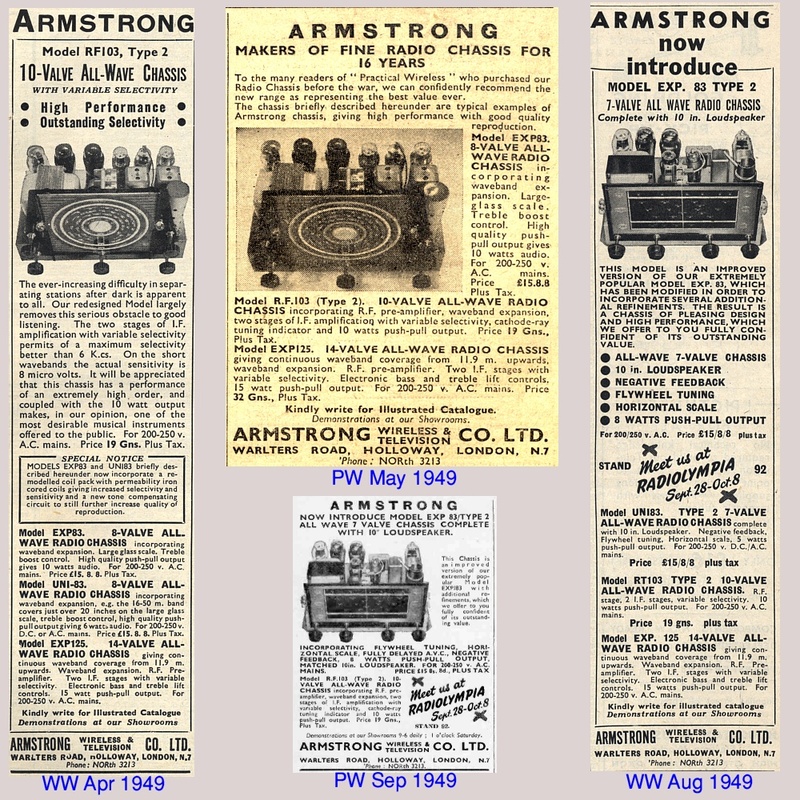 Overall, the advertisements during 1947 show a picture of Armstrong steadily expanding its range of chassis sets with every sign that the company was increasingly successful, having recovered from the war period. However the adverts continued to make particular mention of export and overseas markets. That may be an indication of a continued pressure on UK makers to export rather than use resources for domestic sales. Developments during 1948 are illustrated by the above examples taken from Wireless World. Rather than continue to introduce many new models, the direction of progress was to improve or extend the usefulness of established ones. Hence the announcements at the end of the year of the RF103 (type2) and changes to the EXP83/UNI-83. However as in previous years, no mention of any televisions. But the ads continued to mention the export market. Note in particular the comment in the Jan 1948 advert that Armstrong, “...can confidently recommend RF103 to any firm abroad...”. The implication being that chassis models were on sale to radio and radiogram manufacturers abroad to fit into their own cabinets and then sell on the retail market in their own countries. i.e. commercial OEM sales, not just retail to individuals. During the first few months of 1949 the advertisements mention that the UNI-83 and EXP83 chassis being made “...now incorporate a new coil pack...” and “...new tone compensating circuit”. Later adverts introduced the EXP83/2 which was available with a loudspeaker. The advert in the August 1949 issue of Wireless World (and at least one other advert in a subsequent issue) mentioned an “RT103” chassis. However this may have been a misprint and the unit was actually meant to be the RF103. 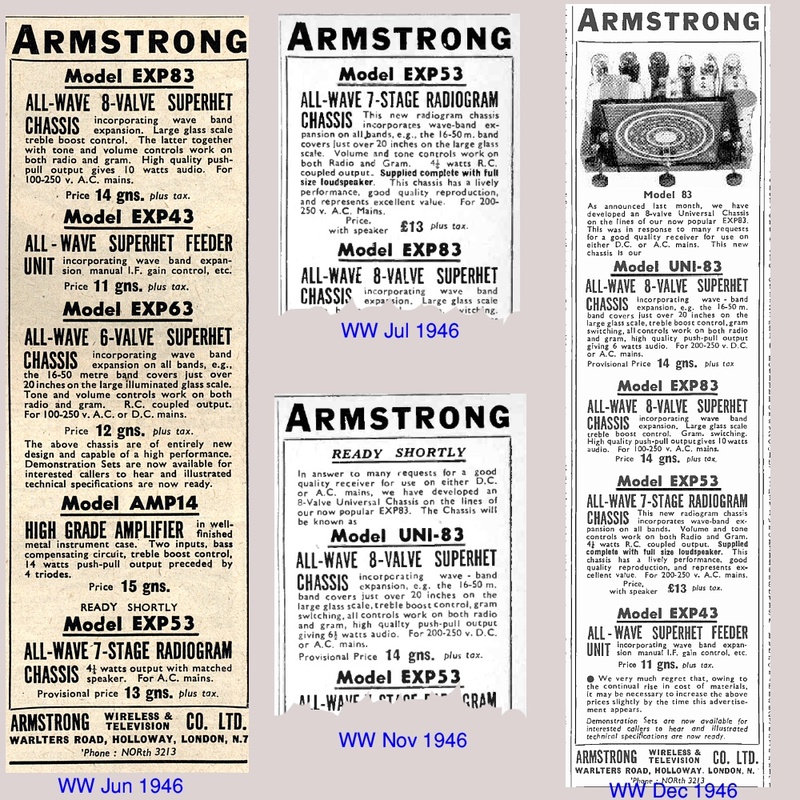 During the last few months of the 1940s Armstrong finally began to mention their television chassis models in the advertisements in Wireless World. The advert in the October 1949 issue said they were presented at the Olympia Show. It also listed the EXP125/2, in addition to the EXP83/2, UNI-83/2, and mentioned an EXP10 chassis. At the top of the list of items in this advert, however, is a mention of a “Long Range, Large Tube Television Chassis”. The November advert featured the EXP125/2 which was presumably developed from the EXP125. (Which in turn might perhaps have been a descendant of the earlier AW125PP chassis.) The December advert described the RF103/3 and gave a very brief description of the “Armstrong Television Model TV.20” as having a 12" CRT. P.S. regarding the J tube. I remain uncertain as to just what the ‘J tube’ Armstrong made during the war might have been. Some candidate items have been proposed by various people I’ve asked about this mystery. Perhaps the most plausible stems from a description in the book, Saga of the vacuum tube by Gerald F. J. Tyne. (ISBN 0-672-21470-9 and 0-672-21471-7) published in 1977. On pages 99 and 100 this describes a J tube which was a form of ‘ruggedised’ vacuum tube (valve) designed for military use. In particular this was designed to continue to function when subjected to high levels of vibration, mechanical shock, etc, and could be employed for amplification, oscillation, or signal detection. i.e. a fairly general purpose device. This is in a chapter with the title “The entrance of industrial laboratories and military demands, 1910-1920 United States”. Which deals the WW1 period, and with an American device. Whereas the items made by Armstrong were built during WW2 for the RAF! However it is possible that the term ‘J tube’ was then being used as a generic name to indicate a device for military use without making too clear the details of the actual device or its application. Having contacted the RAF Museum in London, they pointed out that during WW2 the Ministry of Supply was responsible for the manufacture of munitions. Whereas the Ministry of Aircraft Production was responsible for the manufacture of the aircraft and the equipment installed into them. 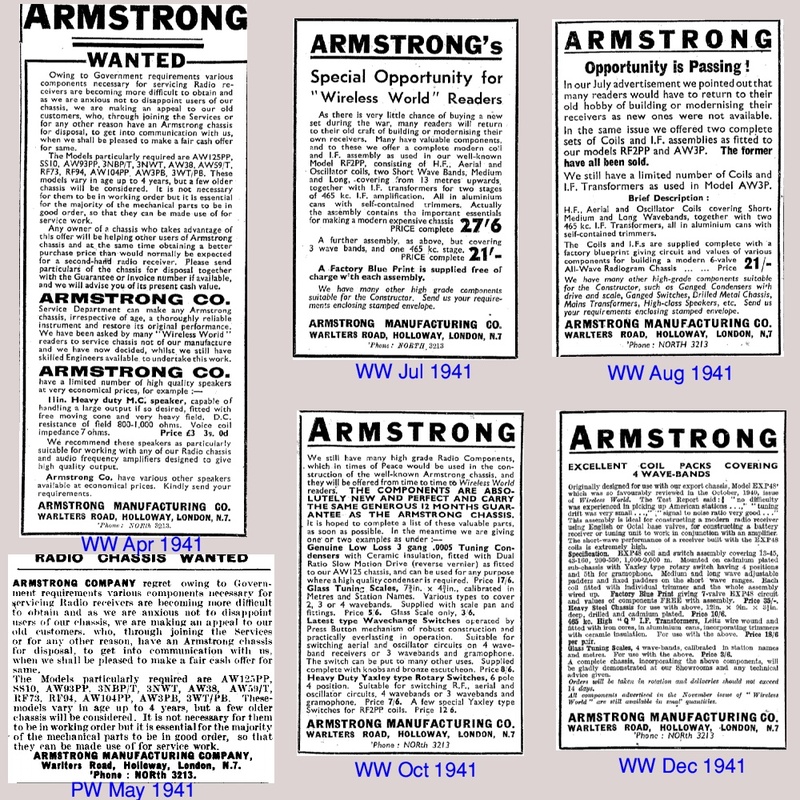 The implication of this distinction is that the wording of the Armstrong advertisement implies that what they made weren’t for munitions because such work would have been assigned to the Ministry of Supply. The wording thus makes it likely that the devices were for installation in the aircraft. However this makes the sheer number made – well over 12 million – remarkably high. An alternative possibility which has been suggested to me is a mechanical device which was patented in the USA as early as 1997 (!) as a component of patent 585,957. This is a tube employed in breech loading ordnance. As above, it is perhaps possible that the term ‘J tube’ became a generic term which was used during WW2 as a name for what Armstrong manufactured in large quantity. However this also leads to the same problem as the above – i.e. that as ordnance it would be expected to have been made for the Ministry of Supply. The question of the Ministry mentioned in the advert may, however, be a result of the two Ministries becoming combined at a later date, thus clouding the issue. So although the above remain possible explanations it remains unclear what was really made, and what purpose it served.